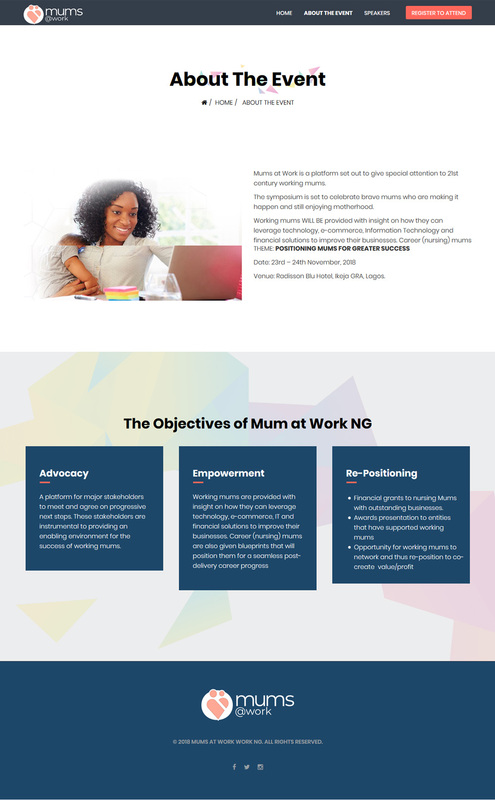 The Mums at Work Conference Website Design is a CMS driven website. It is mobile responsive and user friendly. At DientWeb, part of our services is website design for conferences and events. Particularly, this website was built for the 2018 Mums at Work Conference. This annual conference provides special attention to working women. As a results, it celebrates brave working mothers and their achievements. The Mums at Work Conference empowers women on ways to improve and sustain businesses. Therefore, eCommerce and information technology are part of her focus areas this year. The Mums at Work Conference Website allows the organizers to meet some defined goals. One of these was the registration of participants. The website also provide details of the expected speakers and their social media handles. This is to provide participants an easy way to keep in touch with the speakers even after the conference. Website design for conferences and events? Website design for conferences and events are very important. Thus, we always devote resource to it. This is so that it serves its purpose effectively. Over the years, our web designers have worked with conference and event planners. Therefore, experience is part of what we bring into conference and event website design. The Mums at Work Conference Website Design was indeed unique. First of all, the goal was to ensure that the websites was attractive and easy to use. As a result, we made sure participants were able to register with ease. Our web designers are always ready to work with you. The successes recorded through the Mums at Work Conference Website was huge. You can contact us for your conference and event website design as well. We will do more than just design your conference website. Certainly, we will provide free Technical Support to ensure your website runs smoothly.